of emphasis on the personal creative process. Good stuff, really. Everytime I open lenswork, I’m surprised by what I see. JPG is something special, which I enjoy very much. The publication is community driven. Imagine facebook for photography. You create a (free) account, you log onto the site, you upload pictures, maybe some text. Maybe it’s an essay, maybe it’s only a single image. It could be also an interview with a photographer or a short article on a technique. Whatever it is, you put it up there. Then along comes an issue announcement. Issue 12 (which is out now shown here) has the theme Fashion. You think your picutres fit in? You submit to the issue, the other users vote and whomever has the best stuff makes it in. Maybe there’s some editorial leaway which the publishers take (the publishing company is the small 9 person team 8020 Publishing), I’m not sure. I don’t think it’s too much, otherwise the members of the community would get fed up pretty quickly. The same company is coming up with a new periodical on the same concept, Everywhere Magazine, a travel publication. I just think this concept is brilliant. Finally, there’s Aperture. This is a photography magazine produced quarterly by a foundation whose purpose is to advance fine art photography. To be honest it’s only the second time I buy it, but every time I’ve bought it because there was some nice, thought-provoking stuff in there. In this issue, there’s a series of images of inmates inside South African prisons. It’s good stuff. So between those 3, I think I’m covered for a while. I think I make good images, just not interesting images most of the time. I do like Brooks Jensen’s (of Lenswork) constant suggestion: “Present images in a portfolio.” Maybe it’s something about how, when assembling images in a coherent set, you’re not just telling a story with a single image, but you have an overarching epic saga overlaid on top of the group of images. Like writing a novel. At least, that’s what Jensen says. I’ll just have to try it! Now, this whole discussion about art periodicals does tie-in with my constant complaining and occasional constructive criticism of the scientific communication scene. Here we have three periodicals (and I didn’t make the list up to suit my discourse, I really read those three) with vastly varying degrees of “internet use”. 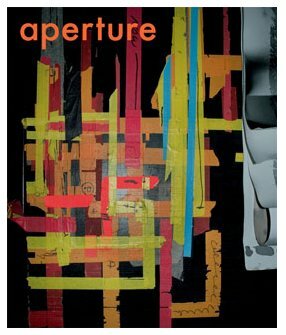 At one extreme, we have Aperture, which uses “the tubes” in the 1998 way. They have a staff to pick what goes into every edition. They put it in. They print it and you buy it at the shop. Their website is used to let you know that the latest issue is out (or maybe to let you know what they’re about entirely). It’s a one-way talk. That is, they walk and we listen. Don’t get me wrong, they have really good things to say! There’s just no direct channel to have a conversation. It’s like going to a lecture on photography every three months. In the center, we have lenswork, which uses the internet quite a bit more than Aperture. They’re very 2003 if I may say so. On the one hand, you have the print edition. It’s one-way talk, as one would expect. But the website is used heavily. You have podcasts which appear regularly (more frequently than the print edition) on different subjects related to photography. There’s an extended edition of the print edition, which has, I think, the entirety of the interviews where the bits that were cut out is when they’re discussing particular pictures. In the extended edition, you can listen to the interview while the pictures are shown on the screen. Now that I think of it, Brooks Jensen has some really cool podcasts every once in a while. He picks images and just talks about what those images mean to him and why he finds them appealing. Really great stuff. You can talk back through the common means. You can send e-mails to Jensen, use comment forms on the site. The standard internet tools that everyone knows about. It’s still not at the highest level of internet connectivity, but it’s definitely higher than most. Finally, up there in the stars, you have JPG magazine. Now THEY are very 2007. I would even dare to say, they may even be very 2008. The print edition is only an extension of what happens online. JPG mag is an online community as well as a magazine. People comment on each other’s stuff, you get feedback not from the editorial staff, but from your peers. The best stuff only happens to be printed in dead-tree form. Maybe I shouldn’t use that expression in this case. Photography is one medium for which prints just look much better than on screen. We’re still not at the point where we can display on screen in a consistant fashion across the world a quality rendition of a visual work. So paper is still good for that. Now, why am I so extatic about JPG? Well, I can imagine all the criticism they had at the beginning, and which they probably still get. JPG mag is still only about a year old, if even. You know the comments I’m talking about. Yet, it works. I think you get more professional stuff in publications like Aperture and Lenswork. Granted. But in JPG, you get stuff that wouldn’t get published otherwise and stuff that IS really interesting. Yes, you get a lot of amateurs (dare I say mostly), but good amateurs. In Aperture and Lenswork, you get professionals who produce professional looking images. In JPG, you get a lot of amateurs who produce professional looking images. Without JPG (and flickr, and zooomr, and …) we just wouldn’t be exposed to those images. It’s printed on glossy paper. How does the presentation quality of the three periodicals compare? They’re all on par. How does that translate in terms of price? 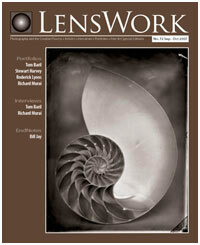 Aperture is sold at 15$US, lenswork at 10$US and JPG at 6$US. Oh yeah, and none of these publications rip you off. You retain the copyright over your images (at least for lenswork and JPG mag), they don’t get a free pass to use your images everywhere and they all get you some sort of monetary compensation and a year’s subscription to their respective publications (again, for Lenswork and JPG, I haven’t looked at Aperture, but these are pretty standard terms, I would expect the same). First, I get quality art to look at and to learn from. I also get quality art I wouldn’t have been exposed to 5 years ago and as a bonus, I get a data point that says that community driven efforts can easily result in professional products. Yes, one data point that says that out of the chaos of self-reviewed, self-policed, self-evolving online communities, the quality stuff emerges on top and gets recognition. Now, you remember that the next time somebody tells you the internet is only full of nonsense and reading blogs is useless. I’ll just remember to keep bringing an issue of JPG along with me whenever I’m having a discussion about my science communication framework. Could come in handy. Somehow, I get similar criticism every time.